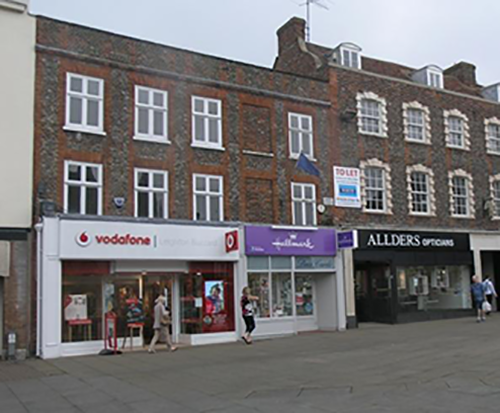 The premises are situated adjacent to the Market Cross and next door to Boots it is an established and prime location extremely visible and has an excellent pavement depth, and had been trading as a shoe shop for over 60 years and for the past few years has been occupied by Vodaphone. The premises have a modern shop front with a net frontage of 18’4”, the upper floors also extend across above No 59 which is adjacent. The shop is fully fitted out with dry lined plaster boarding to all walls, with storage area to the rear with security cage, and refitted wc and kitchen beyond. The shop is carpeted and fully heated by combined heating/ air con units. The shop extends back 66ft, providing approximately 1037 sq ft of retail space, with a further 500 sq ft of storage beyond, which possibly could be incorporated within the existing shop. The upper floors although accessible from the shop, could be used for either storage, staff training or residential accommodation, subject to the necessary planning consent being obtained. The property has been well maintained and modernised throughout by the existing occupiers. VAT: We are informed that the property is registered for vat purposes. 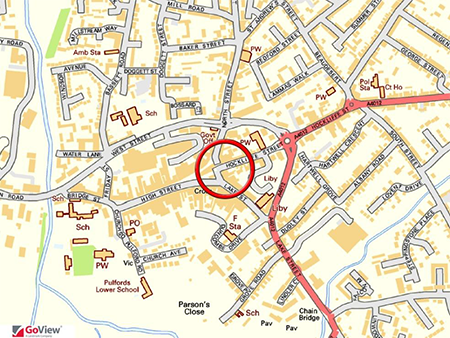 PLANNING: The current planning use is A1 retail, and the property is listed grade 2.